Our Chief Executive writes on ending Veterans’ homelessness. You can read his blog over on the Huffington Post. Every year there are well over a thousand ex-service personnel who become homeless or who face the risk of homelessness and are in urgent need of housing. With others experiencing crises in their lives, urgent intervention is needed to provide the necessary support for vulnerable veterans. Whilst there is a significant amount of good and effective provision to support veterans, new research from the University of York highlights there are still many ex-service personnel falling unnecessarily through the gaps. Now is the time to tackle this important issue. We have an opportunity to reduce veteran homelessness to virtually zero simply by bringing about change to the way serving personnel are supported when leaving the Forces. Stoll and Riverside, in collaboration with Cobseo, The Confederation of Service Charities, have published a series of recommendations in a Call to Action that aims to tackle homelessness amongst veterans. Our goal is achievable but it requires the support of Government, Local Authorities, charities and other agencies that come into contact with veterans. For many ex-service personnel, the transition from the military to civil life is relatively smooth but, at the very least, it involves both a change of employment and accommodation. It’s often when these factors don’t go to plan that the risk of homelessness increases. We need to ensure that every single Service Leaver is supported through this transition process, whatever their circumstance. This includes, for example, asking whether they have a suitable housing option before they leave service. If they do not, it is important that they are offered the appropriate support and bespoke advice so that each veteran has a clear housing pathway. This is covered in a Service Directive, but not being applied consistently and we are pushing to make sure that this becomes the case. Many veterans are falling through the cracks because there is a lack of awareness around the need, or of the solutions available, to veterans post-service. Increased resources from the Ministry of Defence would ensure that every channel that a Service Leaver goes through enables access to a specialist housing advisor. A commitment to support every service leaver with housing must be a key plank of the Government’s forthcoming Transition Plan and veterans’ Strategy. Local Authorities have an instrumental role in ensuring that veterans do not slip through the net and end up homeless. A key part of this support is to ensure that veterans are featured within their housing and homelessness strategies. The guidance around the 2012 Homelessness Act must be rigorously applied by Local Authorities so that authorities are not only asking the question about whether an applicant for housing is a veteran, but also have the knowledge about what do when they do identify a veteran. We know that there are thousands of homeless veterans who require support each year, but the data on the extent of homelessness amongst veterans is incomplete. Although Local Authorities record homelessness data, there is no specific reference to veterans. We need this to change so that every Local Authority proactively identifies veterans coming through their doors. This can be achieved by a simple change to the H-CLIC form, used by Local Authorities to submit homelessness data to Government. The veterans’ housing sector is relatively new and dynamic. We are committed to ensuring that the provision we provide is aligned to the needs of veterans experiencing homelessness. The Cobseo Housing Cluster has made considerable steps to supporting ex-service personnel through the formation of the Veterans Housing Advice capability. This is a service that we would like to see endorsed by the Government and Local Authorities as the main point of contact for veterans. The veterans’ housing sector is the only area of supported housing in the UK which predominately self-funds its own provision. This presents a real and significant risk to its sustainability. A solution to the long–term sustainability of the sector would be the funding nationally of revenue costs for support services, through a fund established by the Ministry of Housing, Communities and Local Government. In addition, as part of its review of funding for supported housing, the Government should ensure that veterans living in short-term accommodation continue to have their housing costs met through the benefits system. The opportunity to end homelessness amongst the veterans’ community is much less to do with resource and far more to do with the will to achieve it. 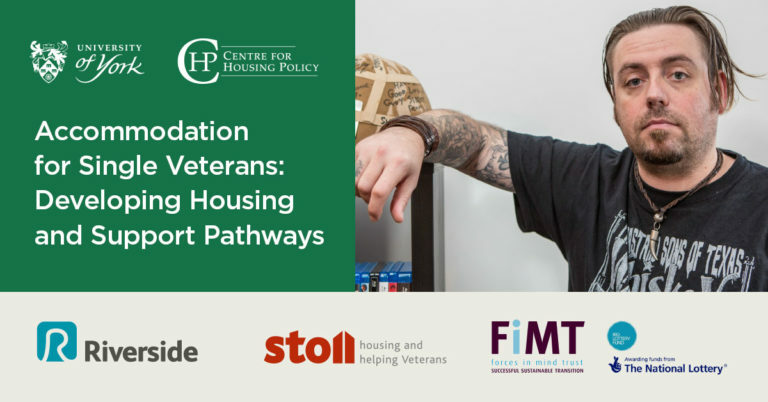 If we can ensure that every single Service leaver has a clear pathway to housing, that agencies that interact with homeless veterans identify them and refer them to the correct advice; and if this can be enshrined within strategy and practice, then we can really reduce veterans’ homelessness to virtually zero. We have an opportunity to reduce veteran homelessness to virtually zero simply by bringing about change to the way serving personnel are supported when leaving the Forces.